In Greek mythology, Atlas (Eng. /'æt ləs/ Gk. Ἄτλας) was the primordial Titan who supported the heavens. The Titans (Greek: Τῑτάν Tītā́n; plural: Τῑτᾶνες Tītânes) were a race of powerful deities that ruled during the legendary Golden Age. The Twelve Olympians, led by Zeus, overthrew the Titans in the Titanomachy ('War of the Titans'). The Titans were then imprisoned in Tartarus, the deepest part of the underworld, with a few exceptions–those who didn't fight with Kronos. Atlas was part of a "second generation" of Titans; the children of Titans were also known as Titans. The Titans' role as Elder Gods was overthrown by a race of younger gods, the Olympians, in much the same fashion as the mythological paradigm shift that occurred in the Ancient Near East. Near Eastern religion developed from animism to one centered on the celestial bodies. Political leaders came to be seen as representatives of these heavenly rulers. The interest in the heavens led to the rise of astrology and astronomy. Like their predecessors, the first generation Titans and some of the second generation were associated with heavenly bodies and celestial phenomena. 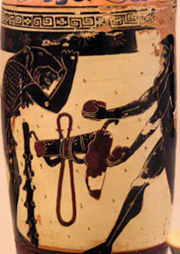 Greek mythology remains an important influence on the culture, arts and literature of Western civilization. Though the ancient Greek religions based upon these tales have long since faded into obscurity, Greek myths remain the archetypal sources for much of Western fiction, poetry, film and visual art. Greek mythology has played a pivotal role in the development of modern studies of mythology, psychology, and philology, and exercises a role in business and marketing as well. Atlas is among the figures who have lent their names to a wide variety of products. There are twelve Titans from their first literary appearance, in Hesiod, Theogony; Pseudo-Apollodorus, in Bibliotheke, adds a thirteenth Titan Dione, a double of Theia. The six male Titans are known as the Titanes, and the females as the Titanides ("Titanesses"). The Titans were associated with various primal concepts, some of which are simply extrapolated from their names: ocean and fruitful earth, sun and moon, memory and natural law. The twelve first-generation Titans were ruled by the youngest, Kronos, who overthrew their father, Oranos ('Sky'), at the urgings of their mother, Gaia ('Earth'). The Titans later gave birth to other Titans, notably the children of Hyperion (Helios, Eos, and Selene), the daughters of Coeus (Leto and Asteria), and the sons of Iapetus—Prometheus, Epimetheus, Atlas, and Menoetius; all of these descendants in the second generation are also known as "Titans." "Now Iapetus took to wife the neat-ankled maid Clymene, daughter of Ocean, and went up with her into one bed. And she bare him a stout-hearted son, Atlas: also she bare very glorious Menoetius and clever Prometheus, full of various wiles, and scatter-brained Epimetheus." Hyginus emphasizes the primordial nature of Atlas by making him the son of Aether and Gaea. In contexts where a Titan and a Titaness are assigned each of the seven planetary powers, Atlas is paired with Phoebe and governs the moon. He had three brothers–Prometheus, Epimetheus and Menoetius. Atlas, along with his brother Menoetius, sided with the Titans in their war against the Olympians, the Titanomachy. His brothers Prometheus and Epimetheus weighed the odds and betrayed the other Titans by forming an alliance with the Olympians. When the Titans were defeated, many of them (including Menoetius) were confined to Tartarus, but Zeus condemned Atlas to stand at the western edge of Gaia, the Earth and hold up Ouranos, the Sky on his shoulders, to prevent the two from resuming their primordial embrace. Thus he was Atlas Telamon, "enduring Atlas." 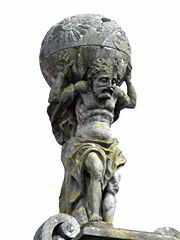 A common misconception is that Atlas was forced to hold the Earth on his shoulders, but this is incorrect. Classical art shows Atlas holding a Celestial Sphere, not a Globe. In a late story, a giant named Atlas tried to drive a wandering Perseus from the place where the Atlas Mountains now stand. Later, out of pity, Athena revealed Medusa's head, turning Atlas to stone. As is not uncommon in myth, this account cannot be reconciled with the far more common stories of Atlas' dealings with Heracles, who was Perseus' great-grandson. According to Plato, the first king of Atlantis was also named Atlas, but that Atlas was a mortal son of Poseidon. A euhemerist origin for Atlas was as a legendary Atlas, king of Mauretania, an expert astronomer. One of the hero Heracles' Twelve Labors involved the acquisition of some of the golden apples which grow in Hera's garden, tended by the Hesperides and guarded by the dragon Ladon. Heracles went to Atlas, the father of the Hesperides, and offered to hold the heavens for a little while in exchange for the apples, to which Atlas agreed. This would be an easy task for Atlas since he is related to the Hesperides who tend the apples in Hera's garden. Upon his return with the apples, however, Atlas attempted to trick Heracles into carrying the sky permanently by offering to deliver the apples himself. Heracles, suspecting Atlas didn't intend to return again, pretended to agree to Atlas' offer, asking only that Atlas take the sky again for a few minutes so Heracles could rearrange his cloak as padding on his shoulders. When Atlas set down the apples and took the heavens upon his shoulders again, Heracles took the apples and ran away. The etymology of the name Atlas is uncertain and still debated. Virgil (70 B.C.E. – 19 B.C.E. ), took pleasure in translating etymologies of Greek names by combining them with adjectives that explained them: for Atlas his adjective is durus, "hard, enduring", which suggested to George Doig that Virgil was aware of the Greek τλήναι "to endure"; Doig offers the further possibility that Virgil was aware of Strabo's remark that the native North African name for this mountain was Douris. Some modern linguists derive it and its Greek root from the Proto-Indo-European root *tel, 'to uphold, support'; while others believe that it is a pre-Indo-European name. The Etruscan name for Atlas, aril, is etymologically independent. Atlas' best-known cultural association is in cartography. The first publisher to associate the Titan Atlas with a group of maps was Antonio Lafreri, on the title-page to Tavole Moderne Di Geografia De La Maggior Parte Del Mondo Di Diversi Autori; however, he did not use the word "atlas" in the title of his work, an innovation of Mercator who dedicated his "atlas" specifically "to honour the Titan, Atlas, King of Mauritania, a learned philosopher, mathematician, and astronomer." Since the middle of the sixteenth century, any collection of cartographic maps has come to be called an atlas. Gerardus Mercator was the first to use the word in this way, and he actually depicted the astronomer king. 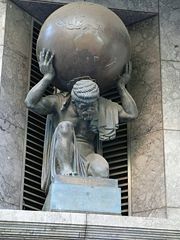 Atlas continues to be a commonly used icon in western culture (and advertising), as a symbol of strength or stoic endurance. He is often shown kneeling on one knee while supporting an enormous round globe on his back and shoulders. The globe originally represented the celestial sphere of ancient astronomy, rather than the earth. The use of the term "atlas" as a name for collections of terrestrial maps and the modern understanding of the earth as a sphere have combined to inspire the many depictions of Atlas' burden as the earth. Atlas was used as a symbol in Ayn Rand's philosophical novel, Atlas Shrugged. Atlas is used as a metaphor for the people who produced the most in society, and therefore "hold up the world" in a metaphorical sense. In the 'Worlds Strongest Man' competitions, competitors have to carry huge stone boulders across a small distance. These stones are known as the Atlas Stones. ↑ Walter Burkert, The Orientalizing Revolution: Near Eastern Influence on Greek Culture in the Early Archaic Age (Harvard University Press, 1992), 94f, 125-127. ↑ Aeneid iv.247: "Atlantis duri" and other instances; see Robert W. Cruttwell, "Virgil, Aeneid, iv. 247: 'Atlantis Duri'" The Classical Review 59 (1) (May 1945): 11. ↑ George Doig, "Vergil's Art and the Greek Language" The Classical Journal 64 (1) (October 1968): 1-6: 2. ↑ Strabo, 17.3; since the Atlas mountains rise in the region inhabited by Berbers, it could be that the name is taken from one of the Berber languages. ↑ Paolo Martino, Il nome Etrusco di Atlante (Rome: Università di Roma, 1987). ↑ Diodorus Siculus, The Library of History, 4.26.2 Diodorus was known for his attempts to convert the stories of myth into factual histories. ↑ Hyginus, Fabulae 82, 83. Origin of "Atlas" for a collection of early maps.mapforum.com. Retrieved October 20, 2008. This page was last modified on 27 April 2016, at 16:36.